Step up your garage game with these great flooring ideas! Tire marks, oil leaks, dirt and grim is what an ordinary garage floor accumulates everyday. But don’t be ordinary! 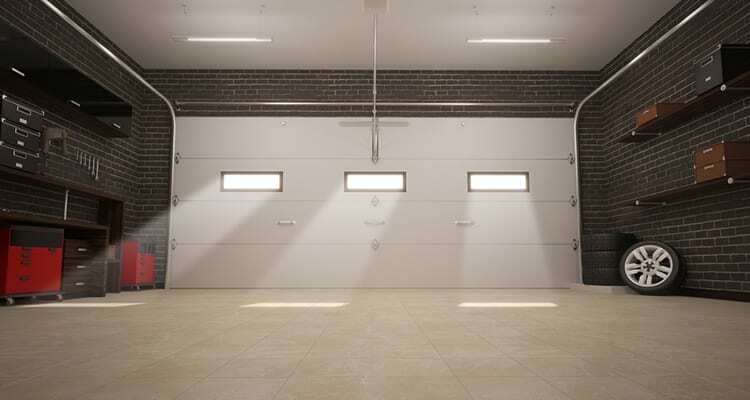 Adding flooring to your garage turns a boring and dull space into something new and exciting (Plus it adds more value to your home) Check out the different types of flooring you can install in your garage to bring it to life! The installation is super simple. You easily snap together the tiles, step on them to ensure they’re locked in, and enjoy! Snap tiles come in many sizes, colors, and styles and are very easy to clean. Because they are very flexible and fairly pliable, they can withstand heavy vehicles and equipment being held in your garage. Rollout mats are effortless to insert in your garage. Just roll them out, cut wherever needs a fit, and you’re done! You can either use one mat for under each vehicle or simply cover the entire garage floor with rollout mats. Concrete sealers are the least expensive coating for your garage floor and can easily be applied with a paint roller. Sealers are fairly like floor paint but tougher and are available in two different types for your preference; Acrylic/latex and Urethane. Use a primer for oil-based acrylic/latex sealers and they’re easy to touch-up every few years. On the other hand, urethane sealers are a lot tougher than acrylic/latex sealers. The finish is a beautiful clear, high-gloss but can be a bit more to invest in. Concrete stains are known for their gorgeous natural stone or marbled look. The labor process takes a bit more time and does require waxing and sealing to prevent moisture, chemicals, and stains. Concrete floor paint is a lot different than concrete sealers. Keep this in mind! Concrete paint is a very tough finish, affordable, and can easily be applied like any other paint. There are two types; Epoxy and concrete floor paint (latex, oil-based). Epoxy paint is your heavy duty coat you can buy, but requires to work in smaller sections because they can harden really quick. In contrast, floor paint is a lot easier to apply than epoxy and can be touched up if needed for damaged areas. The oil in this paint dries to a high gloss and requires a primer before application.